Yesterday we did something we’ve kind of been putting off for a few weeks: We moved our entire indoor kitchen to our outdoor kitchen set-up, in anticipation of the plastering and flooring work that needs to happen this season. If you do a quick Google or Pinterest search for images of “Outdoor Kitchens,” you’ll find some rather inspiring, attractive, and no doubt, expensive arrangements of stainless steel appliances and grills. Many are centered around warm-season cooking and entertaining and provide space for seating, cooking, and shade. Brings the heat outdoors. Cooking takes place outside, thus keeping our house cooler. This is particularly helpful when water bath or pressure canning! We decided that the general layout of last year’s outdoor kitchen worked rather well for us, so the “bones” of the kitchen remain the same. We did have to replace the shade/rain tarp, and we are keeping some pantry items indoors for ease of storage. Mid-move out! The counter on the left will be the main food preparation area. We have oils and sauces, spices, cutting boards, bowls, and knives stored in this area. We will also keep our Berkey water purifier near the counter’s edge for easy kid access. To the right of the photo is a previously owned stainless steel sink, complete with running water from our house water catchment barrels. After living without running water for the past 7 months, this is a real treat! The dishwater drains into plastic buckets, and we use the greywater to water fruit trees. Last year’s set up (above) and our efforts thus far (below). 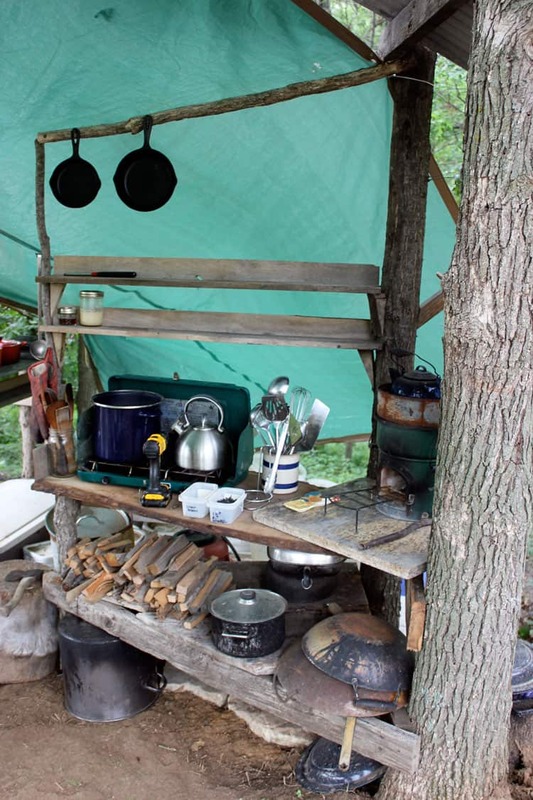 Much of our summer cooking will take place on either a rocket stove, or in a Sun Oven. We have a great two-burner propane stove that we use as well. Often, all of these cooking surfaces are in use at the same time! Another photo from last summer, but it shows the layout of our entire outdoor kitchen. To accommodate terrain changes, we had to build a lower-level terrace (behind the cooking area), which I found to be very difficult to navigate quickly. I’d suggest keeping your outdoor kitchen all on one level and orienting key features (sink, cooking area, prep area) in a triangle for ease of work flow. An effective homestead outdoor kitchen space could be as simple as setting up a few card tables under a shade structure, or as elaborate as you can imagine. Happy outdoor cooking! Looks great! I like how you put the kindling right next to the stoves. Very usable setup. We could never do that here, though. You guys must not have bears! True, no bears. 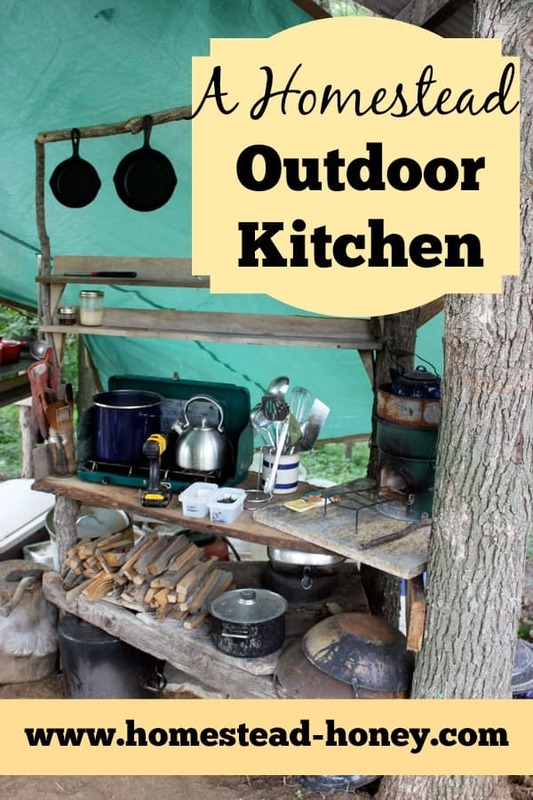 I didn’t even think about bears being an issue for an outdoor kitchen, but at the very least, a very small and temporary outdoor set up could be an asset for canning season! Your kitchen set up looks like a lot of fun. 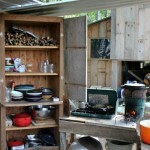 I would like to have an outdoor kitchen to wash and prepare garden foods for long term storage. It would keep the mud from root vegs and other vegetable matter out of the indoors. Insects and strong winds would be a problem. How do you deal with those? We do have some problems with mice and ants, but other insects have not really been an issue. We keep all of our food either in glass jars, or in coolers or rubbermaid containers, which for the most part, keeps them safe. 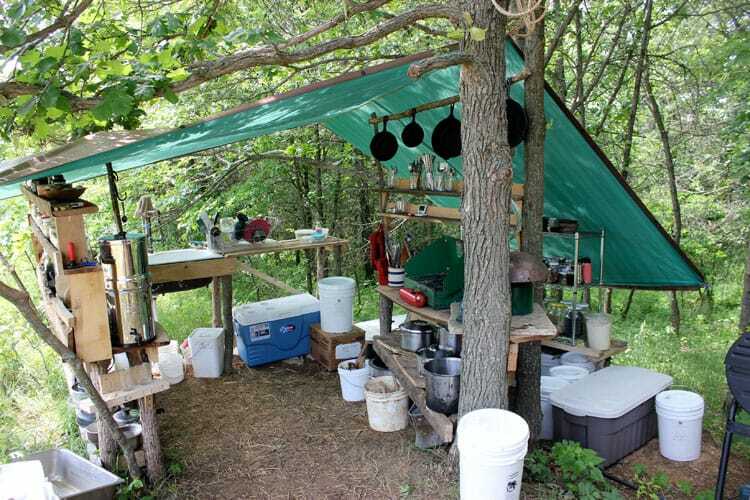 As for wind, the tarp is the most vulnerable element in our kitchen, as the wooden frame is really quite sturdy. This year, we beefed it up a bit by putting short “walls” behind the spices and other shelves where we might have glass jars. I bet you could also get cabinets fairly inexpensively at a ReSTORE or other 2nd hand building store and keep things safe in there. This outdoor kitchen is a wonderful idea! 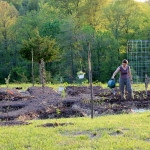 I was wondering what I was going to do in a few days when we get to our new little homestead. Thanks for sharing! I hope it works out well for you! Good luck with your new homestead. I love your outdoor kitchen! I’m always so inspired by your family’s creativity. Sounds like a great system, Nancy! I just wanted to let you know that I chose this post as my featured post from the From the Farm Blog Hop this week! I look forward to see what you share next! I love this kittchen! 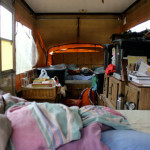 Moving into our off grid cabin this spring with 4 of our 5 children. 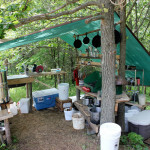 I am inspired for the outdoor kitchen…tho we will use ours for everyday use..not just canning as others have commented. We love the outdoor kitchen, and use it exclusively from about May or June through October. These days, everything is frozen outside, so we’re in the process of moving the kitchen indoors, but It’s such a nice change to cook outside in the shade and the breeze! Thanks for the inspiration! 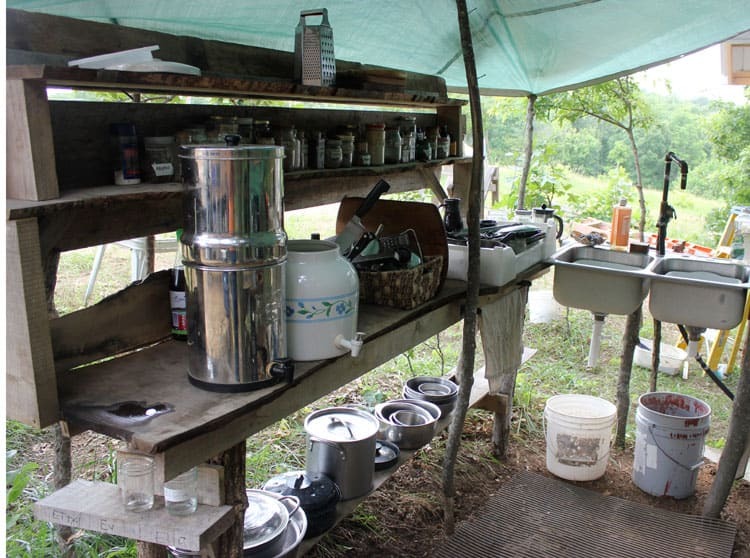 I am looking forward to setting up my outdoor kitchen under a giant laurel tree down here in Patagonia as we get our new homestead up and running, Fundo La Campanilla, Bellflower Farm, for the foxglove that grow wild in our woods. We almost have running water but for now are using one of the many springs on our farm. No power yet and it may be a while so I will be reading a lot of your blog posts on living without electricity when I go into town for the Wi-Fi! I’m not to worried about having no power but I am worried about my 2 teenage boys living without internet 🙂 Any suggestions on laundry? What an adventure! I have to admit that we’ve never really been without internet, because we had a smartphone and some solar chargers. Plus an office space elsewhere. As for laundry, my husband likes to use the Amish washtub system that we have, but I usually use the laundromat in town to wash, and our clothesline to dry. We can do multiple loads at once, and it saves me a lot of time. Good luck with setting everything up! I love your kitchen! Did you build your rocket stove yourself? And if you did, do you have plans you could share? I would love to be able to build one. 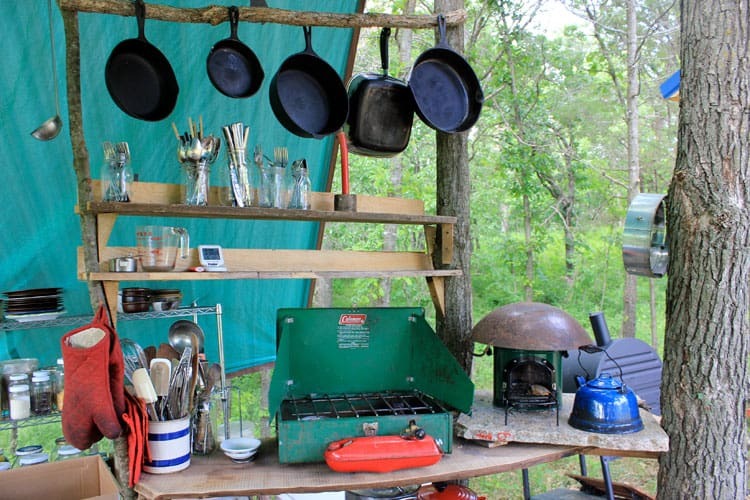 For canning, do you use the propane stove or the rocket stove? Thank you so much. Thanks Correne! No, we did not build the rocket stove – we are good friends with the creators of the StoveTec stove, so we purchased one of theirs. It works well. 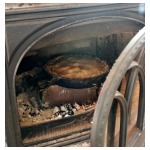 For canning, recently we’ve been using our campfire (with 3 stones to prop up the pot). It is SO much quicker than a rocket or propane stove. But when that’s not possible (Rain, fire danger), we use the rocket stove. I’m checking out their website now! (StoveTec) Thank you. Not sure what shipping to Canada would be like though. For someone who is new to canning what would you recommend as a good method to start? Thanks again. We use both a water bath and pressure canner. Both are relatively easy to use, but have specific steps that you need to follow. Pressure canning is for low acid and low sugar recipes. Usually your extension service will have instructions. Unfortunately, I don’t have any how-to’s on my blog. Starting with a simple jam is a good project to get your feet wet with water bath canning! I’d also recommend helping someone who knows what they are doing the first time. Good luck!